Monday, July 6, 2018 – Johns Hopkins researchers in collaboration with Insilico Medicine, a biotechnology company based in Rockville Maryland, identify that silencing of the GULP1 gene expression by methylation plays an important role in ovarian carcinogenesis. In a report published in Cancer Letters journal the authors, including researchers from both Johns Hopkins and Insilico Medicine, used an integrated approach by coupling identification of genome-wide expression patterns in multiple cohorts of primary ovarian cancer samples and normal ovarian surface epithelium with innovative computational analysis of gene expression data, leading to the discovery of novel cancer-specific epigenetically silenced genes. The study reveals 43 genes abnormally methylated in the ovarian cancer and identifies methylation of an engulfment gene, GULP1, as potential biomarker of ovarian cancer. It was found that in at least one third of over 400 ovarian cancer cases analyzed, GULP1 is methylated. Inverse correlation of GULP1 methylation with expression was also observed in the TCGA data set, further validating these findings. Furthermore, GULP1 methylation was associated with late stage disease, and worse overall survival, suggesting that GULP1 expression plays an important role in ovarian cancer pathogenesis. This also sheds light on the mechanisms underlying GULP1-mediated growth suppression. The authors used iPANDA, a bioinformatics software suite for analysis of intracellular signaling pathway activation based on transcriptomic data (developed by InSilico Medicine, a biotechnology company located on the Johns Hopkins University of Montgomery County Campus that focuses on artificial intelligence-driven drug and biomarker discovery platforms), to compare signaling profiles between GULP1-low-expressing and GULP1-high ovarian tumors in TCGA ovarian cancer dataset. This analysis has predicted that mitogenic and survival signaling pathways, such as AKT, MAPK/ERK, RAS, ILK, PAK/P38, WNT and JNK were significantly upregulated among GULP1-low tumors. These pro-survival signaling axes play a crucial role in cancer initiation, progression and maintenance in various solid tumors, including ovarian cancer, and may contribute to acquisition of an aggressive phenotype via inhibition of apoptosis and induction of cell proliferation. In line with these observations, pro-apoptotic and anti-proliferative pathways including those associated with TP53 and TGF-β signaling were predicted to be downregulated in most of the GULP1-low tumors. In accordance with the in-silico analysis, reconstitution of GULP1 expression in vitro resulted in marked suppression of MAPK and AKT phosphorylation, along with concomitant reduction in cell proliferation, survival and invasion, while GULP1 depletion led to opposite effects. Taken together, these findings indicate that GULP1 may assert tumor suppressive activities by tethering members of multiple, cross-talking pathways involved in cell growth and survival control. 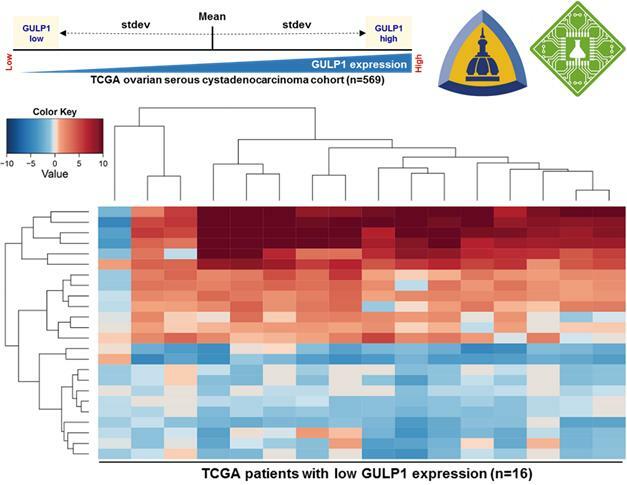 While this study implicates that epigenetic regulation of GULP1 expression may play an important role in ovarian cancer, and suggests its potential clinical value as a promising prognostic biomarker, other possible mechanisms for GULP1 down-regulation may include microRNA-mediated silencing, transcriptional regulation, or homozygous deletions. Therefore, deeper understanding of the role of GULP1 in the development of ovarian cancer may offer additional possibilities for the management of this disease, and further studies are planned to fully elucidate the role of GULP1 in tumorigenesis. Insilico Medicine is regularly publishing research papers in peer-reviewed journals. The company was first who applied deep generative adversarial networks (GANs) to the generation of new molecular structures with specified parameters and published seminal proof of concept papers in the field. The paper published in Molecular Pharmaceutics in 2016 demonstrated the proof of concept of the application of deep neural networks for predicting the therapeutic class of the molecule using the transcriptional response data, received the American Chemical Society Editors' Choice Award. A recent paper published in November 2017 described the application of the next-generation AI and blockchain technologies to return the control over personal data back to the individual. One of the latest papers published in the Journals of Gerontology demonstrated the application of the deep neural networks to assessing the biological age of the patients. Insilico Medicine is an artificial intelligence company headquartered at in Rockville, with R&D and management resources in Belgium, Russia, UK, Taiwan and Korea sourced through hackathons and competitions. The company and its scientists is dedicated to extending human productive longevity and transforming every step of the drug discovery and drug development process through excellence in biomarker discovery, drug development, digital medicine and aging research.